Welcome to the Metro Vanpool Program Frequently Asked Questions Page. Below you will find a list of commonly asked questions and answers about the Metro Vanpool Program. If you cannot find the answer to your question, Contact the Metro Vanpool Program Help Desk 213.922.7003 or vanpool@metro.net . We will be happy to help. 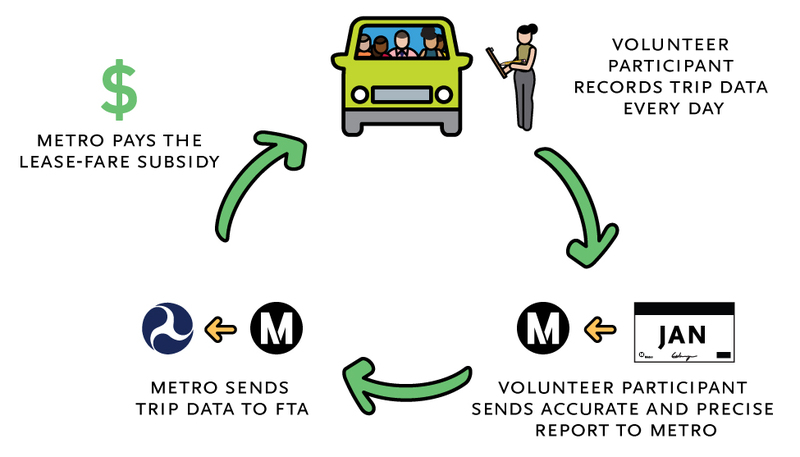 Metro requires all Volunteer Participants to record accurate and precise data. While we understand that for many vanpools there may be little variance in trip occupancy, time, or distance, it is vital to the continued success of the program for Volunteer Participants to report accurate and precise data. Below, you’ll find a detailed example of the accuracy and precision that we require. Following the example, we’ve answered the most commonly asked questions about accurate and precise reporting. As a friendly reminder, when you sign the Monthly Vanpool Report you are certifying that the data presented are accurate, true, and correct. Metro is grateful to all our Volunteer Participants who record their daily trip information and submit accurate and precise Monthly Vanpool Reports. Your accurate and precise data allows us to pay your lease-fare subsidy. Consider three trips to work, Monday, Tuesday, and Wednesday. On Monday, every one rode to work and there was heavy traffic along your regular 20-mile route. On Tuesday, two passengers were out sick and luckily, there was no traffic on your regular 20-mile route. On Wednesday, one passenger was still sick and there was a road closure along your regular route. The closure caused a heavy traffic jam and you had to take a four-mile detour off your usual route. Below, you will find answers to the most commonly asked questions about accurate and precise reporting. If you cannot find the answer to your question, contact the Metro Vanpool Program Help Desk 213.922.7003 or vanpool@metro.net . We will be happy to help. Why can’t I just submit estimates? What do I gain by recording and reporting accurate and precise data? Metro compiles all the data collected from the Monthly Vanpool Reports and submits it to the Federal Transit Administration’s National Transit Database. The rules that govern the database require actual data. Approximate and estimated data are explicitly forbidden. Therefore, Metro must require that all Volunteer Participants report accurate and precise data. Metro is only able to pay your lease-fare subsidy when you track your accurate passenger counts, precise trip times, and exact distance. What if I just fill in my Monthly Vanpool Report approximate info? 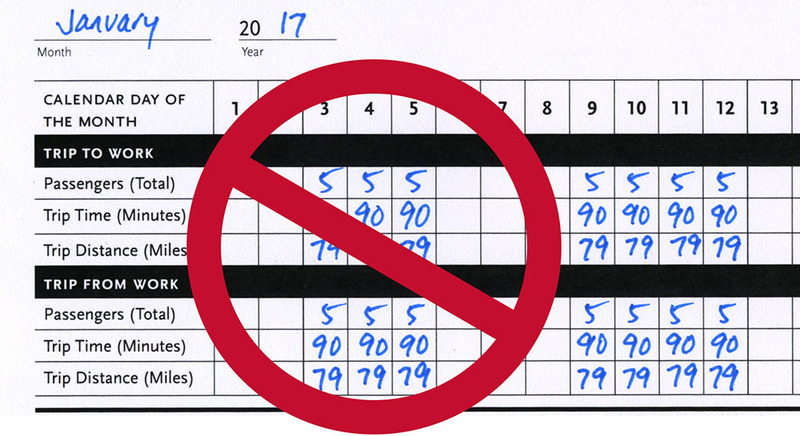 When you sign the Monthly Vanpool Report you are certifying that the data presented are accurate, true, and correct. If a Volunteer Participant submits approximate or estimated data, we may have to terminate our agreement and discontinue their lease-fare subsidy. We never have absences. Can I just fill in the Monthly Vanpool Report with the number of passengers? All vanpools will have absences from time to time. Someone might be out on vacation. A passenger might be sick. Someone might be away on business travel. These are just some examples of things that would affect your passenger count on a given day. As the Volunteer Participant, it is your responsibility to record the actual number of passengers on each trip and report that number on your Monthly Vanpool Report. We never encounter traffic. Can I just fill in the Monthly Vanpool Report with the approximate time it takes? Everyone in Southern California experiences traffic jams from time to time. Traffic volumes fluctuate and therefore travel times will vary. Is school in session? Is there a holiday? Is it raining? 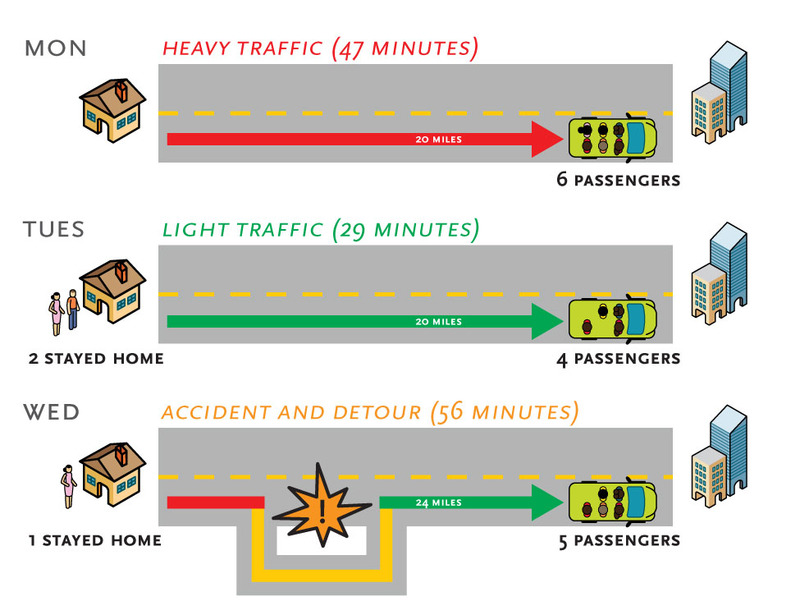 These are just some examples of things that would affect your travel time. As the Volunteer Participant, it is your responsibility to record the actual travel time on each trip and report that time in minutes on your Monthly Vanpool Report. Our route never varies. Can I just fill in the Monthly Vanpool Report with the approximate number of miles? Metro recognizes that most vanpools will take the same route every day. But, there are occasions when your route will change. Is there a bad car crash that causes you to detour? Is there construction project that closes the roadway along your route? Is there a shortcut you take occasionally? These are just some examples of things that might cause your distance to vary. As the Volunteer Participant, it is your responsibility to record the precise distance traveled and report that distance in miles on your Monthly Vanpool Report. We have people that travel a lot for work. Since they are paying passengers, can I include them even if they are not present? Even if passengers are paying for the privilege of riding in your vanpool, only those people who are actually present on the trip can be counted on your Monthly Vanpool Report. If you have passengers that are frequently away, we suggest recruiting part-time or casual riders to fill in for those regular passengers that are absent. I received a phone call, letter, or email from Metro about submitting estimates. What should I do? Review your past Monthly Vanpool Reports. Do they reflect the actual operation of your vanpool? No vanpool has perfect attendance every day, month after month. All vanpools in Southern California will be stuck in traffic or have slower/faster trip times. Occasionally, all vanpools will encounter a road closure or otherwise be forced to detour from their regular route. These variances will occur on every vanpool. As the Volunteer Participant, it is your responsibility to record accurate and precise data on your Monthly Vanpool Report. Below, you will find answers to the most commonly asked questions about the Vanpool Update form. If you cannot find the answer to your question about the Vanpool Update form, contact the Metro Vanpool Program Help Desk 213.922.7003 or vanpool@metro.net . We will be happy to help. I can’t find the complete street address for one of my Pick-Up locations. We understand that not all park and ride lots have complete street addresses. Use our Pick-Up location address finder . That interactive map allows you search for the most common Metro Vanpool Program Pick-Up locations. If your Pick-Up locations are not on our map, use the address of a nearby business or home. (Also, let us know about the missing location. We will add it to the map). If there are no nearby locations for which you can find complete street addresses, call the Help Desk, 213.922.7003. We will be happy to help. Do I really have to provide complete street addresses? Yes. Metro has to store all Pick-Up and Drop-Off locations by their complete street address. A complete street address includes the number, the street, the city, and the zip code. If you are having trouble finding a complete street address for your pick-up location, try the Metro Pick-up Location Address Finder or call the Help Desk, 213.922.7003. We will be happy to help. We usually operate the vanpool on weekdays, but only every other Monday, occasionally on Saturdays. What Operating Days should we put for our schedule? For your schedule, only indicate the days you intend to operate every week. So, in your case, check Tuesday, Wednesday, Thursday, and Friday. Since you only operate every other Monday, do not indicate Mondays as a regularly scheduled operating day. Since you operate occasionally on Saturdays, do not indicate Saturdays as a regularly scheduled operating day. Please note that you should report all actual operating days on your Monthly Vanpool Report, regardless of your reported schedule. Why do I have to submit a Vanpool Update form to Metro? I already submitted my changes to my Vehicle Supplier and employer. When you become the Volunteer Participant you enter into a one-to-one relationship with Metro. Only you can make changes to your personal contact information, route/schedule, or your passenger list. When there are changes to your vanpool you will need to submit those changes to Metro using a Vanpool Update form. My spouse handles all the paperwork for me, please call him. When you become the Volunteer Participant you enter into a one-to-one relationship with Metro. Unfortunately, we cannot discuss your personal information with anyone other than you: the enrolled Volunteer Participant. This prohibition includes spouses, employers, alternative drivers, and registered passengers. My passengers do not want to give me their phone numbers. Can I just give the main phone number for our office? Metro requires a direct and unique phone number for all registered passengers. Passenger telephone numbers may be home, mobile, or direct dial work. If you provide a main number you need to provide the extension of each passenger. If a passenger does not want to provide a direct phone number to you, he or she is ineligible to be a registered passenger on your vanpool. Why do you need two unique phone numbers for me? We may need to contact you urgently. For example, if you forgot to submit a Monthly Vanpool Report, we will call all the phone numbers we have on file until we reach you. Why do you need an email address? Email is the primary way we contact our Volunteer Participants. We send an email to announce the opening of the Monthly Vanpool Report In-Take Period. If we receive an unacceptable Monthly Vanpool Report or Vanpool Update form we will send an email detailing our findings. Metro strongly advices Volunteer Participants to provide a personal email address that you will check frequently. We have more than three Pick-Up or Drop-Off locations. How should we describe our route? Metro can store a maximum of three Pick-Up locations and three Drop-Off locations. If you have more than three, report 1) the furthest location, 2) a representative location in the middle, and 3) the final location along the route. I just got married and I changed my last name. How do I update my Metro Vanpool Program Agreement? Congratulations. To change your name, simply complete a Vanpool Update form. Use your new last name and your current vehicle number. Be sure to update your email address if it changed too. Also, notify your vehicle supplier of your change according to their procedure. Below, you will find answers to the most commonly asked questions about the Audit process. If you cannot find the answer to your question about the Audit process, contact the Metro Vanpool Program Help Desk 213.922.7003 or vanpool@metro.net . We will be happy to help. My vanpool will not operate on the assigned date. What do I do? If your vanpool will not operate you will need to state the reason for non-operation anywhere on the form, sign it, and return it to Metro. If there have been changes to your Passenger List, be sure to complete a Vanpool Update form so we can process the changes. If you are randomly selected to conduct and Audit on a day of the week you vanpool does not normally operate, be sure to update your schedule using a Vanpool Update form. See this link for more details on how to update your schedule. How do I reschedule my assigned Audit date? Metro has to follow a sampling plan that has been approved by the Federal Transit Administration. Unfortunately, reassigning a randomly selected vanpool to a different date violates that plan. I will not be on the vanpool the day of the Audit. Am I still required to do it? Yes. You do not need to be present on the day of the Audit. If the vanpool will operate in your absence, then ask someone else on the vehicle to complete the Audit on the assigned date. Just make sure you are the person that signs it. And, enjoy your day off. How do I submit my Audit? Email a scanned PDF of your Audit and Vanpool Update form to vanpool@metro.net or send by fax to 213.652.1112. Why do I have to complete the Audit? Without the data from the Audits, Metro would be unable to fund the Metro Vanpool Program. Metro is required to report total passenger-miles* annually for entire Metro Vanpool Program to the National Transit Database. But, we do not collect this data on the Monthly Vanpool Report. 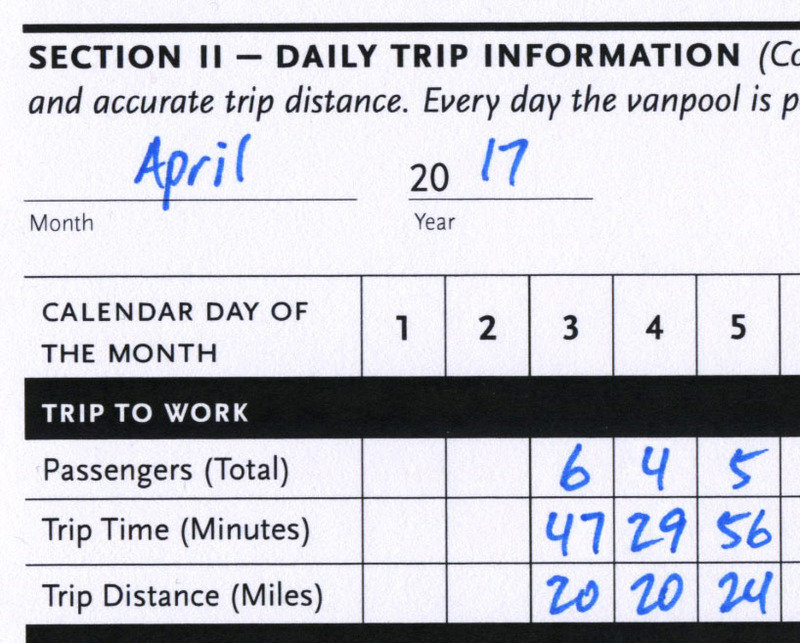 In the Monthly Vanpool Report we ask you for the total number of passengers and the total miles for each trip. But we do not know if all those passengers traveled all those miles. For example, let’s say three people (George, Fernando, and Elaine) board the vehicle at the first pickup location and travel 10 miles. Then, three more people (Beryl, Ignacio, and Martin) board the vehicle at the second pick-up location. All six people then travel another 20 miles to work. The total passenger-miles for that trip will be 150 passenger-miles. See graphic above and equation below. On your Monthly Vanpool Report you would just record 6 passengers and 30 miles. Based on that data we cannot calculate the actual passenger-miles for the trip. Since we do not collect enough detail on the Monthly Vanpool Report, we take a random sample of vanpools to collect this information. We use the data collected from the Audits to calculate the total passenger-miles for the Metro Vanpool Program and fulfill our obligation to report that data to the National Transit Database. * Passenger-miles are the cumulative sum of the distances ridden by each passenger. What do I gain from conducting the occasional Audit? The data collected from the Audits allows Metro to collect less information on the Monthly Vanpool Report. See previous question and answer. If we did not require Volunteer Participants to conduct randomly selected Audits we would have to collect much more detail on the Monthly Vanpool Report. Essentially, Volunteer Participants would have to complete a level of detail similar to the data collected on the Audit every day the vanpool operated. Thus, completing the occasional Audit saves you time every month on your Monthly Vanpool Report. I just completed an Audit and now I got another one. We conduct the random draws once per month for the following month. Each day a vanpool operates is one vanpool-day. A typical Monday to Friday vanpool operates about 20-22 vanpool-days per month. We add up the number of vanpool-days for all enrolled vanpools each month. For example, when we did the draw for November 2018 we had 1,266 enrolled vanpools that were scheduled to operate a total of 27,984 vanpool-days that month. Of the total number vanpool-days, we randomly select 30 for Audit. There is about a 1 in 933 chance of being selected for an Audit on any given vanpool-day. By luck of the draw, you could get several Audits in a short period of time. Should you receive multiple Audits in a given month, be sure to conduct every audit on the assigned date. The passenger list you have is very out of date. What should I do? The passenger lists we have in our database are as accurate as possible based on the data we receive from you, the Volunteer Participant. If you do not submit a Vanpool Update form with each change to your passenger list, we have no way of knowing. Neither your vehicle supplier or employer will tell us about passenger changes. It is up to you to let us know when there is change in your passenger list. You can make up to six changes (add or remove) to your passenger list per Vanpool Update form. Complete and submit multiple Vanpool Update forms if necessary. We had our usual vehicle for the ride in to work and a loaner vehicle on the ride home. How do we report this on the Audit? It is possible that your vehicle supplier will swap out your vehicle on the same day as you are assigned to conduct an Audit. If this happens, conduct the audit as required and record the actual odometer readings for both trips. Explain why the odometer readings do not match by making a note in the margin of the Audit. In the event an enrolled Volunteer Participant is unwilling or unable to continue his or her responsibilities, the Volunteer Participant will need to terminate his or her agreement. If the vanpool will continue, someone else will need to apply to be in the Metro Vanpool Program. When this happens simultaneously, we call it a Volunteer Participant Switch. 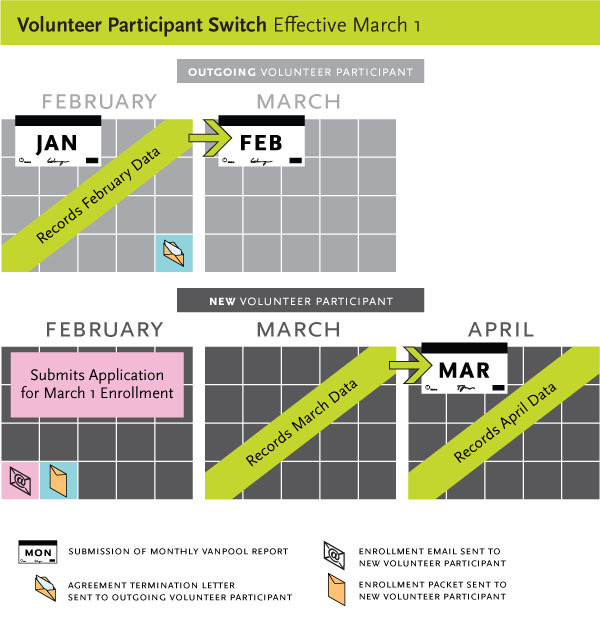 Below you will find, a table of terms used, an example of the dates and responsibilities of all involved with a Volunteer Participant switch, and answers to the most commonly asked questions about switches. The most important thing to remember is to start this process as early as possible and read all communications from Metro carefully. The person applying to be in the Metro Vanpool Program who will assume the responsibility of the vanpool. Suppose that George is the Volunteer Participant of a vanpool. He plans to retire at the end of February. Mary and the other passengers wish to continue vanpooling to work. In this example, George is the Outgoing Volunteer Participant and Mary is the New Volunteer Participant. The graphic below shows the responsibilities of the outgoing and new Volunteer Participant respectively. Recall that George is retiring at the end of February. So, Mary would need to reach out to her Vehicle Supplier and let them know she is willing and able to take over George’s vanpool. The Vehicle Supplier will let Metro know to send an invitation to Mary to apply. She will receive her invitation by email from Metro. Mary needs to submit a complete and valid Metro Vanpool Program Application and Agreement during the first two weeks of February. If she is accepted into the Metro Vanpool Program, she’ll assume responsibilities as of March 1. In this example, George’s Metro Vanpool Program Agreement termination date would be February 28. During the first three business days of March, George must complete and sign his final Monthly Vanpool Report for February. Mary will start recording the operations of the vanpool during the month of March. She will submit her first Monthly Vanpool Report during the first three days of April. Even though Mary is enrolled as of March 1 she cannot submit the Monthly Vanpool Report for February. That is the responsibility of George alone. The Outgoing Volunteer Participant’s agreement terminates on February 28. The Outgoing Volunteer Participant submits his final Monthly Vanpool Report for February during the first three business days of March. The New Volunteer Participant submits her application during the first two weeks of February. The New Volunteer Participant submits her first Monthly Vanpool Report for March during the first three business days of April. I am a newly enrolled Volunteer Participant. When do I submit the Monthly Vanpool Report? New Volunteer Participants will submit their first Monthly Vanpool Report for the month in which they become enrolled. For example, if you submitted a complete Metro Vanpool Participation Application and Agreement on February 10 for March 1 enrollment, you will receive an enrollment notification by February 20. If accepted into the program, you will begin collecting data on March 1, and submit your March Monthly Vanpool Report during March In-Take. The Monthly Vanpool Report In-Take Period opens on the last day of the month and closes on the third business day of the following month. View the Metro Vanpool Program Calendar . Also, see graphic above. Below you’ll find a table to help you identify when you will submit your first Monthly Vanpool Report. I am the Outgoing Volunteer Participant. Do I still need to submit a Monthly Vanpool Report? As the Outgoing Volunteer Participant, you must submit all Monthly Vanpool Reports up to and including your agreement termination date. For example, if the New Volunteer Participant taking over is enrolled effective March 1, you must submit the final Monthly Vanpool Report for the month of February. As the Outgoing Volunteer Participant, you will receive an agreement termination letter in the mail. The letter will show your agreement termination date and request that you submit your final Monthly Vanpool Report for the final month of your enrollment. See the graphic above for an example. Below, you’ll find a table to help you identify when you will submit your final Monthly Vanpool Report. I am applying to take over as Volunteer Participant and received the Metro Vanpool Participation Application and Agreement in an email from Metro. Since the route information, passenger list, and vehicle will remain the same, do I have to complete the Application? Yes. Anyone applying to be a Volunteer Participant is required to complete and submit the Metro Vanpool Participation Application and Agreement. The application will be evaluated in accordance to the Metro Vanpool Program eligibility requirements outlined in the Participation Guidelines. I am a current Volunteer Participant, but I would like another person to take over. Can I just submit a Vanpool Update form? No. The Volunteer Participant role cannot be transferred using a Vanpool Update form. In order to facilitate a Volunteer Participant Switch, please contact your Vehicle Supplier. Your Vehicle Supplier will notify Metro of this change. Once the Metro Vanpool Program hears from your Vehicle Supplier, Metro will email the Metro Vanpool Participation Application and Agreement to the new Applicant. I am the newly enrolled Volunteer Participant, can you tell me if the Outgoing Volunteer Participant submitted his last Monthly Vanpool Report? No. Metro can only communicate with the person responsible for submitting the document. In the example pictured above, if there was a question about the February report, we could only speak with the Outgoing Volunteer Participant. If there was a question about the March report, we could only speak with the New Volunteer Participant. Questions about the Metro Vanpool Program can be addressed by Metro staff. Contact the Metro Vanpool Program Help Desk 213.922.7003 or vanpool@metro.net .